Delaware Hayes’ Terin Kinsway (5) puts up a shot over a Scioto defender during the first half of Friday’s league showdown in Dublin. 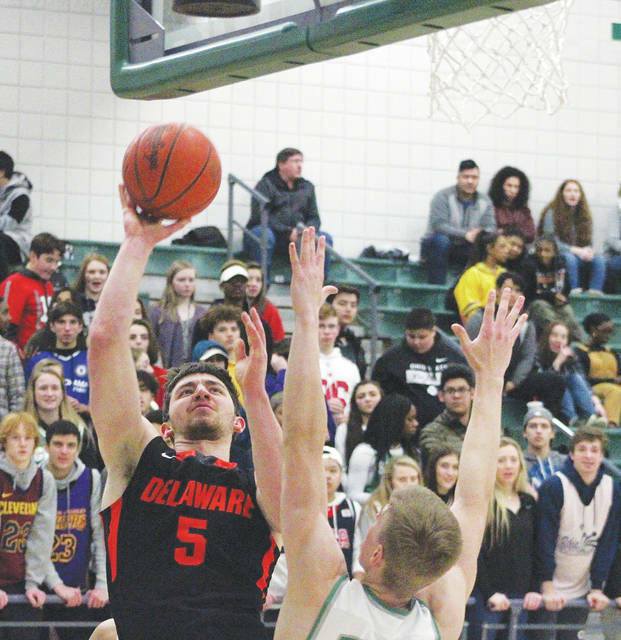 DUBLIN – Delaware Hayes boys basketball coach Jordan Blackburn said sophomore Ryan Smudz has the green light to shoot. The 5-foot-9 guard has picked his spots in the past. And he picked a couple of good ones on a pair of 3-pointers to bookend an 8-0 run in the third quarter that put the Pacers up for good. He had three in the frame to score nine points in Hayes’ 50-39 win over Dublin Scioto in OCC-Cardinal action Friday night. Smudz wasn’t the only attaboy Blackburn handed out. He had one for assistant Keith Butts, who ran film preparation this week leading up to the game. The Pacers defense held host Scioto to just 10 points over the final 12 minutes and 21 seconds of the game. Butts, who graduated from Hayes in 2011, offers the team a different perspective as a former player, who was coached by Blackburn. Butts offered Blackburn the same message from a different voice. Smudz believes the team has started playing for each other rather than playing for the coaches, which is why the Pacers have been so successful this year. Blackburn said Addison Harvey played a big role, coming off the bench in the second half after sitting out the first half. He entered the game just after a Drew Bryant basket underneath gave the Irish a 29-26 lead with 4:21 left in the third. Terin Kinsway and Nate Griggs led the Pacers (10-4, 7-3) with 14 points apiece. Kinsway had six rebounds and Griggs five boards and four steals for Hayes, which bounced back from a loss at Thomas Worthington Tuesday night. The Pacers still have a glimmer of hope at the OCC crown with league-leader Hilliard Bradley coming to Delaware next Friday. The Jaguars hold a three-game lead over Hayes and a two-game lead over second-place Dublin Jerome with four games remaining. Bryant had 11 points, Victor Mwamba pulled down eight rebounds, Zach Gawronski had four steals and Jayden Prince had four assists to lead the Irish (9-7, 5-5). Hayes returns to action Tuesday night, hosting Mount Vernon in non-league play. Tip-off is scheduled for 7:30 p.m.